The Golden Lotus is a new faction in the Mists of Pandaria expansion. Who are they, how do you gain reputation with them, and maybe most importantly what rewards do they have for you? All this and more is laid out in this guide to the Golde Lotus faction. The Golden Lotus is a faction whos main purpose is trying to deal with the Mogu threat that has arisen. They are looking for information on why the threat has arisen at all, and what they can do to resolve it once and for all. That is where you come in, as they need help to find a solution for the Mogu problem. You will first run into the mysterious Pandaren faction after you have reached level 87 and travelled through the Kun-Lai Summit. There you learn of their existence and start a few minor quests. You will then not really learn much more about them until you reach level 90 and can start completing their daily quests. The Golden Lotus storyline is played out over the course of your quests in the Vale of the Eternal Blossoms zone. While most of the quests will be daily quests that you are able to do day after day to earn reputation there are also key storyline quests that can be completed. These quests are generally one time quests that help progress your understanding of what is going on, and guide you to the next part of the story. 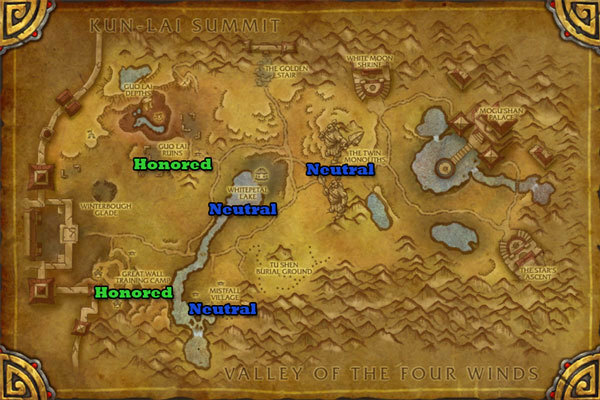 These quests start at level 87 in the Kun-Lai Summit with the quests A Celestial Experience, A Witness to History, Into the Vale, and then The Shrine of Seven Stars (Alliance) or The Shrine of Two Moons (Horde). From this point you can not do anything else until you reach level 90. Once you are level 90 and have purchases the flying ability, you can re-enter the valley and get the quest the Ruins of Guo-Lai and complete it. From there you need to complete Out with the Scouts, Barring Entry, Killing the Quilen, and Stones of Power. This leads to Leaving and Opening which is turned in at the Golden Pagoda. Once completed you will gain access to the daily quests there. When you reach honored you will be given the quest The Secrets of Guo-Lai that has you learn more about the Mogu and the Guo-Lai hall. In addition to learning more, you are also rewarded with an ilevel 440 ring. When you reach revered you are sent on a set of quest to collect the battle spear, battle helm, and battle axe of the Thunder King. Once you collect all three items you will be given an ilevel 463 chest piece. There are 9 different chests to choose from so there is one for everyone. When and if you eventually hit exalted you will be rewarded with access to the quest that leads you to face off against Zhao-Jin the Bloodletter on the quest The Final Power. Once you have defeated him you will be given your choice of an epic ilevel 489 neck piece, of which there are 5 different to chose from. In addition you will earn the achievement Eternally in the Vale. While you do gain reputation through the one time story quests offered as you progress through them, there is no way to advance in any meaningful way without doing daily quests. 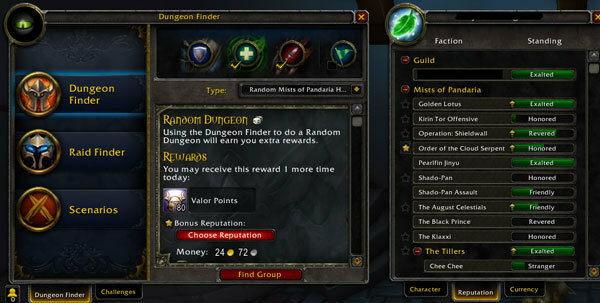 As such there are many different quest hubs and quests that can be completed to gain reputation with the Golden Lotus faction. Remember thought that before you gain access to you will need to complete the initial story line quests as described above. Once that has been done you will be able to work on gaining reputation with the Golden Lotus Clan by completing the daily quests described here. Upon entering the Vale of Eternal Blossoms the first questing area for Golden Lotus reputation will be the Golden Pagoda. The pagoda is in the central part of the zone by the two giant Mogu statues. Here you will have access to several daily quests to earn reputation with the Golden Lotus. There are 13 different quests but only 7 are available each day to complete. These quests are completed at the Golden Stairs. Once you complete the quests there each day you will be sent to a second quest hub, either Whitepetal Lake and Mistfall Village randomly selected each day. Each of these locations give you several additional quests chosen from a larger pool. Once you have reached honored with the Golden Lotus faction even more quests become available to increase your reputation with them. These quests are centered out of the Ruins of Guo-Lai and the Setting Sun Garrion quest hubs. Again there are a huge number of possible quests to complete each day, with you being able to do about 15 quests out of almost 25 different possibilities. Once you have reached revered, a few additional quests open up at each location. In addition some of the quests change to a different version. In addition once you have completed the daily quests one of 7 possible different boss quests will become available. As you can see there are a massive number of daily quests to work on to help you progress through the various reputation levels with the Golden Lotus faction. Be prepared though, it will take a long time to reach all the way to Exalted. Ok, on to the question everyone wants answered at this point, why should you grind reputation with the Golden Lotus? What is in it for you? Well there is the obvious satisfaction of a job well done helping the Pandaren rid themselves of the Mogu menace… Yeah ok, you want something more than that. At each of the reputation levels new items become available to you. Those items are sold by Jaluu the Generous who is the Golden Lotus Quartermaster and cab be found at the Mogu’shan Palace. The rewards available from the Golden Lotus faction become available at honored, revered, and exalted. At honored level you are able to purchase several different ilevel 450 blue quality neck and wrist pieces for 1250 justice points each. There are also two each of hand and leg armor pieces to purchase for 1750 or 2250 justice points respectively as well as a mastery trinket for 1750 justice points. Also at honored reputation there are a pile of leatherworking and tailoring patterns. This means that if you are either a leatherworker or a tailor you will want to reach honored rep as soon as you can so that you gain access to these patterns. The items that are crafted are ilevel 476 epics which will help you gear up for other content significantly. Besides items that you can create patterns are sold for the new versions of both leg armor for leatherworkers and spellthread for tailors. Both of these items will be in high demand as players gear up in Mists of Pandaria. At revered some really great items become available. These items are all ilevel 489 epic items and are available for valor points. The prices range from 1250 for rings, 1750 for shoulders, and 2250 for chest pieces. There are pieces available for pretty much every spec although some may not be perfectly itemized for each spec, there is something that you can use. If you are worried that the items at revered cost valor points and that you may not be a raider, don’t be. Most of the daily quests reward you with at least a few valor points. While it may take a little while to earn enough, it will happen over time. Once you hit exalted reputation there are three different mounts that you can purchase and a vanity tabard. While none of these are really significant in terms of character advancement, they will server for bragging rights to prove that you reached exalted reputation. The first way to gain reputation faster requires you to be working on reputation with any secondary characters that you have (or a primary that is at least revered). Once one character gets to revered with a faction you gain the ability to purchase an item from them called a Grand Commendation. This item allows you to earn double reputation with that faction on this and all other characters that you have. It is an awesome speed boost to earning rep, and one that you should make sure you grab as soon as you hit revered with each faction. It cuts that last 21,000 reputation required to get to Exalted down to half. The fact that it speeds up all other characters sure doesn't hurt either. Do you have any other helpful information about the Golden Lotus faction? Please share it with us and the rest of the Ten Ton Hammer community by posting it in the Comments section below.